Jesus to Simon Peter: "If you love me, tend my sheep." Two weeks ago the new prime minister of Iraq, Mr. Ibrahim Jaafari, appointed Bassima Yousef Boutros, a 44-year-old Assyrian biochemist at Arbil's Salahidin University as the country's new Science and Technology Minister. Ms. Boutros holds a bachelor's and a master's degrees from the university in Arbil, and is currently studying for a doctorate from a Polish university. Ms. Bassima Boutros was recently appointed as Iraq's Minister of Science & Education. Ms. Boutros also ran as a candidate in the January 30th elections. A member of the Assyrian Democratic Movement she is a staunch fighter for the rights of the Assyrians and women in Iraq. Following the announcement of her appointment on 3 May, Ms. Boutros promised that she would "do all my best to use science and technology as the basis to build a civilized Iraq". She also noted that Iraq is "passing through a critical stage." Ms. Boutros has a very difficult road ahead. According to the Science and Development Network, Iraqi science is in ruins, with under-equipped laboratories, few experienced scientists, and deteriorating science centres, institutes and universities. Although the appointment of Ms. Boutros to a ministerial position remains a cause for our joy, it also epitomizes our bitter disappointment with the current government in Baghdad that is more concerned with the ratios of men to women public servants and Kurdish and Shi'ai ministers to their Sunni counterparts. The election of Assyrians - both women - to the Emigration & Displacement Ministry in the past and now the Science and Education Ministry raises a number of questions at a strategic and political level. In brief it sends a very clear signal that Jaffari's government is keeping Assyrians as far away from positions of power as is "democratically' possible, in a way mistrusting the credentials of the qualified Assyrians whose only desire is to put Iraq back on the road to full social and economic recovery. Mr. Jaffari last year appeared as a genuine friend of the Assyrians, even bringing their grievances to the attention of Shi'ai leadership in southern Iraq. Today the reverse is true. The appointment of Assyrians to marginal government positions as diplomatic attachés in Japan, Ambassador to Vatican, head of Science and Technology ministry are regretful. Observers outside of Iraq are seriously concerned about the commitment of Mr. Jaffari's government to the democratic reforms ahead of the ratification of a permanent constitution later this year. Assyrians, as an integral part of today's Iraqi society, are key partners in the success of the republic and want to see their relationship developed and flourishing on the basis of shared values. To speak of respect for the rule of law, human rights and democracy is one thing, to act on it is another. The appointment of Assyrians to politically non-crucial positions is a demonstration of Iraq ’s commitment to these values. The coming weeks will be crucial in this respect as committees to draft a permanent constitution will be formed and more appointments will be announced. If Iraq's Shi'ai and Kurdish groups do not remain willing and open to engage Assyrians in the domestic governance, economic redevelopment and foreign relations, then Mr. Jaffari and president Talabani's commitment to a pluralistic society should be viewed as a first step toward a less tolerant society similar to that in the neighboring Iran where Christians and other non-Islamic minorities are not trusted with the welfare and the security of the society in general. Assyrians in Iraq firmly believe in the reconstruction of the shattered Iraqi society and the role of Iraq as an important member of the world community of nations. This can only come about if a Shi'ai Iraqi places as much trust in a Kurdish interior minister as he would in an Assyrian foreign relations minister. The future of Iraq cannot be left to one ethnicity or one majority religious constituency, rather to every one of its politically astute members. Assyrians are ready and willing to share in the political process which can move Iraq in the direction of economic prosperity and social equilibrium. Placing them in less influential positions will only slow this process and accelerate the transformation of a free Iraq into a less tolerant religious theocracy. Shortly after the Seyfo Genocide of 1915 and the mass exodus of Assyrians from Turkey and Iran to Iraq in 1918, the British authorities decided to employ Assyrian men as protectors of their interests in Iraq. Under the British mandate for Iraq (1920-32), the Assyrians were organized into militia groups, called the the Assyrian Levies. The Levies were used to put down revolts and support the British military presence in Iraq. As soon as Iraq became an independent state and the Levies were no longer needed, the British abandoned the Assyrians and the Levies. This month we commemorate the 50th Anniversary of the disbandment of the Assyrian Levies and the surrender of the British Royal Air Force Station at Habbaniya, Iraq to the government of Iraq. The history of the creation, organization, and the disbandment of the Assyrian Levies in Iraq is quite fascinating and Zinda invites our readers to learn more about the figures and events behind one of the most recognizable, yet least studied pages of our modern history. Refer to several Assyrian websites on this topic. Zinda Magazine is pleased to present two essays by two veteran Assyrian authors of numerous articles on the history of the Assyrian communities in modern Iraq. 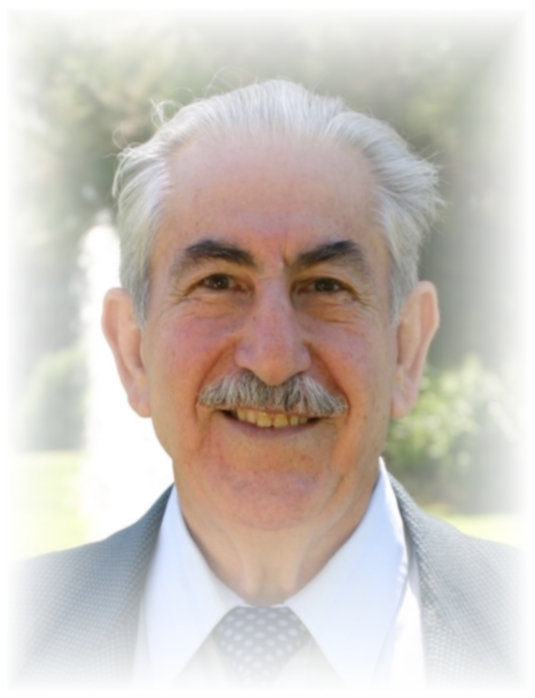 Mr. Solomon Solomon and Mr. Mikhael K. Pius are familiar names to the readers of such fine Assyrian journals as Nineveh Magazine and the Assyrian Star. To commemorate this bitter-sweet golden anniversary Zinda Magazine will in a few weeks make available online the entire collection of the Habbaniya Union School & Community Association Journal, professionally produced and arranged by Mr. Mikhael K. Pius. Habbaniya was the main British air base in Iraq between 1936 and 1955. Situated 55 miles west of Baghdad, it housed the usual buildings of a major air base within its seven-mile circumference fence. That fence had no military value. But it did keep marauding Bedouins out. The base was not only home to the Royal Air Force (Iraq) Levies and their families but it also housed several thousand civilians, employees and their families. The majority were Assyrians. While the Levy Force was raised by the British Army in 1919 in Baquba, its real beginning came into being in 1922 when the RAF took over the responsibility. Between 1922 and 1928 this Force was organized into several battalions and sent to Mosul province to secure the North from rebellious Kurds. That mission being largely fulfilled, the Levies were moved south to the base of Hinaidi on the southern outskirts of Baghdad. Because the British felt it was better to move the base away from the Capital, the hot bed of Arab nationalism, RAF squadrons, Levy troops, and Assyrian civilians moved and settled during 1936-38 at Habbaniya. By the outbreak of war in 1939 the Levy Force was 1250 personnel, consisting of the Force Headquarters and six companies at Habbaniya, and one company at Shaiba. Wing Commander Jim Routledge writes that when Rashid Ali revolt broke in May 1941 the Assyrians stood firm and distinguished themselves in fighting in Habbaniya and as a result of this reliability it was decided to expand the Force. Six months after the revolt, the Levies had increased to 1600 men; a year later there were 6000* Levy soldiers. This Force provided defense for RAF bases in the Middle East. Some 300 were trained as paratroopers of which a company called The 36 Paratroop Company saw action in Europe. On 15th March, 1943, the Iraq Levies were renamed the RAF Levies, Iraq; and to mark their gallantry the troops were authorized to wear RAF Eagle Arm Badge. In 1945 the post-war size of the Levies was planned at 1900. 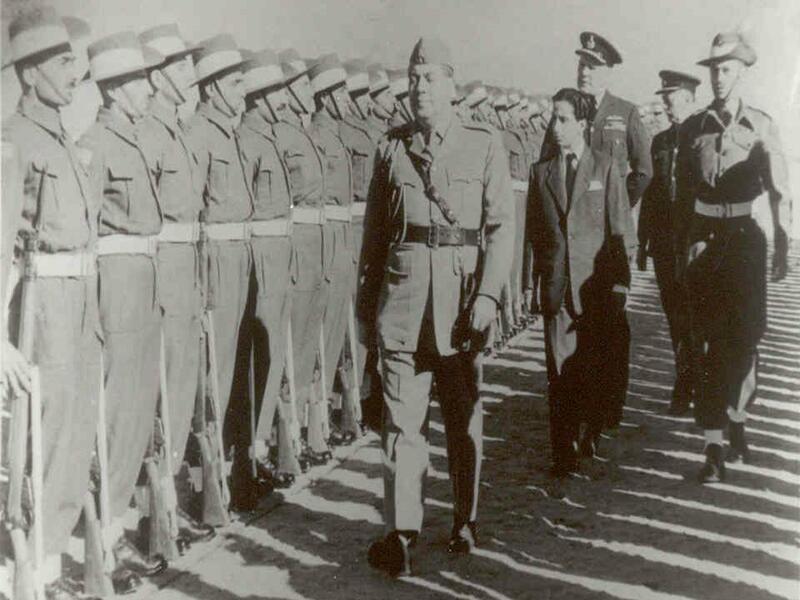 King Faisal II (in civilian clothing) inspecting RAF (Iraq) Levies guard of honor, followed by Habbaniya’s Air Officer Commanding. The Levy Officer is Rab-Emma Shlimon Bukko and Iraqi officer is King’s aide-de-camp Col. Ala Eddeen Mahmoud. The Levies were disbanded on May 2, 1955 when the British closed their bases in Iraq and surrendered them to the Iraqi Government. The total number of the Force was 1107 men. Of these 515 were Assyrians, 384 were Arabs and 208 were Kurds. Of this number, 375 ex-Levies enlisted to serve in the Iraqi Army. This number included 195 Assyrians, 146 Arabs, and 34 Kurds. Between 1953 and 1955 the RAF awarded the Levies the Medal RAF Long Service & Good Conduct with clasp RAF Levies, Iraq, for 18-year service in the Force. Of the total 302 medals awarded, 114 went to Levy Officers and 188 to Levy soldiers. Although Habbaniya was officially known as a Royal Air Force base in Iraq, it was popularly known for two things in particular, namely for RAF (Iraq) Levies, popularly known as “Assyrian Levies,” and for sports, especially football. At the peak of Habbaniya era—at the turn of 1950s—Britannia still ruled the waves but Assyrians protected the British interests in Iraq and ruled the soccer and other sports fields of Habbaniya. When the British surrendered Habbaniya to the Iraqis and broke up the Levy Force in mid-fifties, however, they also severed their connection not only with the Iraqis but also with Assyrians, sweeping the Assyrians’ four-decade loyalty and service to them under the rug. The British-Assyrian connection began way back in WW1, when the Assyrians were lured by British officials’ empty promises of independence to rise up and fight against their overlords the Ottoman Turks and Kurds. And the Assyrians, simple people that they were, put their trust in the Allied Powers because they thought they were “Christians” like themselves. The result was a national disaster. In their moment of crisis the Assyrians were abandoned by both the British and the Russians and left to fend for themselves. Consequently, they were overwhelmed by superior numbers of their enemies, butchered and chased from their homelands in Turkey and Iran down to Iraq. There they became refugees in the protection of the occupying British Expeditionary Forces. And the British made sure that they remained refugees in their own original homeland of Mesopotamia to be used in the interests of His Britannic Majesty’s Government as loyal cheap military and civilian labor forces for four decades—or until the Iraqi revolutionaries came along and kicked the British out. May 20, 1956. 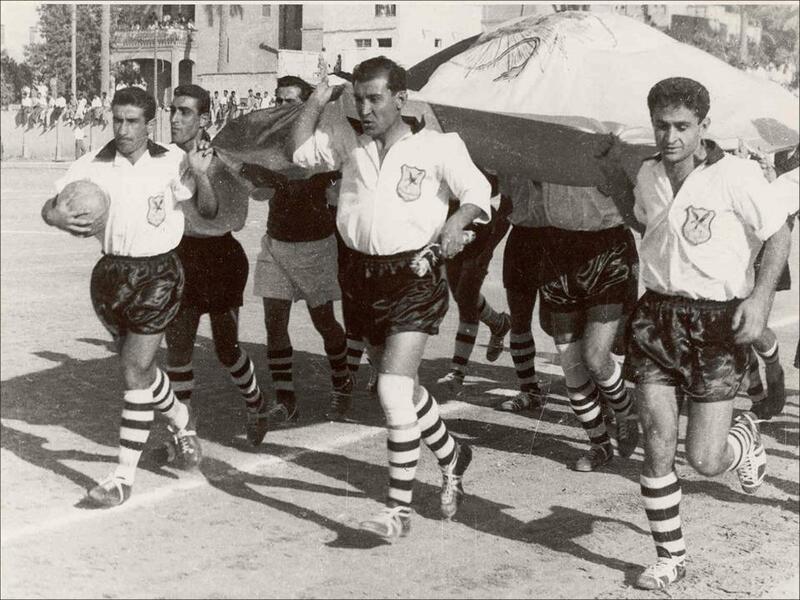 Entering the Scouts Stadium in Baghdad carrying the Iranian flag, is the Assyrian National Team led by three of the most famous Habbaniya’s Assyrian soccer players who, with several others, became the cream of the Iraqi National and International teams following the handover of Habbaniya in 1955. From right Ammo Baba (the greatest scorer ever who later led Iraq’s national team as coach for many years), Aram Karam (Captain, with the most powerful kick), late Youra Eshaya (the English-trained “wizard” and a coach in Sweden). Behind Youra is late Ammo Samson (another great player) and goalie Iskhaq Yacoub. Other team players: William Shallou, Yourish Is-khaq, late Hormis Gabriel, Youel Gewargis, Sargis Shallou, Shimshon Daniel; Reserves: Edison David, Ben Shallou, late Kaako Shallou and Avshalim. Playing under the sponsorship of Assyrian Sports Club of Baghdad, Assyrians beat Taj Club of Teheran 5-4. It was a glorious moment of pride for all Assyrians! Half a century later, Assyriska in Sweden, the pride of all Assyrians today, is carrying on the athletic torch for the nation. 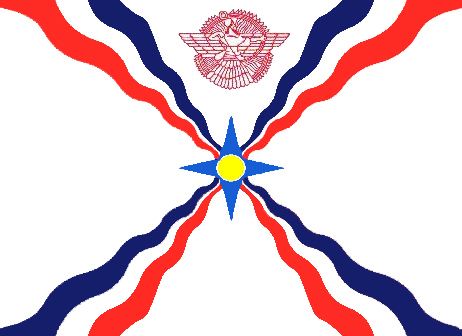 During the Assyrian-British “alliance”, the Assyrian Levies in 1920s rid North Iraq of Kurdish rebels and secured the borders of the new fledgling Kingdom; defended Habbaniya against the Iraqi insurrection forces in May 1941, thereby also foiling a German scheme to control the vital Middle East oil fields during WW2; protected the RAF air bases in Iraq until 1955 and all British installations in the middle East during the war; and generally served the British loyally and at a significant saving to the British Exchequer. But it was the same breed of British protégés, three thousand unarmed defenseless Assyrian men, women and children, who were slaughtered by the Iraqi Army in 1933 in Semaile as RAF airplanes flew over the scenes and took pictures of the atrocities for the British press while restraining the Assyrian Levies to go to their brothers’ aid; the same breed of Assyrian warriors that empowered the Iraqi national soccer teams for almost two decades after ”surrender” of Habbaniya; the same breed of Assyrians whose hundreds of villages and churches were bombed and destroyed in the crossfire between the warring Iraqi Army and the Kurdish “rebels” in North after the mid-1960s; the same breed of Assyrians who lost tens of thousands of their young men in a senseless war waged by the brutal madman Saddam Hussain against Iran in the eighties, a war in which Assyrians had no stake. And the same Assyrians, the indigenous people of Iraq, are still struggling today to protect themselves and live as a people and make a place for themselves in the sun in their own God-given land. Following the “Surrender” in 1955, the Assyrians first scattered all over the country to fend for themselves and, two decades later and thereafter, all over the world, mostly driven away by harassment, hardships and persecution. Assyrians can be found now in every niche and corner of the world, resourceful and loyal for the country in which they live but still without a home they can call their own. To most of the survivors the Habbaniya era revokes nostalgia of bitter-sweet memories. It represents a piece of their life in which they enjoyed a simple cohesive clannish social life of harmony, protected, ironically enough, by the British iron fences of the camps. And yet the same protective iron fences represent a bitter pill, the betrayal and the curtailment of their freedom and the injustices done to them as a nation. Dr. William Eshaya Warda was recently appointed to a diplomatic position in the Iraqi Embassy in Japan. (ZNDA: Baghdad) Dr. William Eshaya Warda has been appointed to a diplomatic position at the Iraqi Embassy in Japan. At the London conference in December 2002, Dr. Warda was elected as a member of the Iraqi Military Council along with Brigadier Tawfeeq Al-Yaseri, Brigadier General Hassan Al-Naqeeb, General Najeeb Al-Saalihi, and Dr. Sa'doon Al-Dilemi. 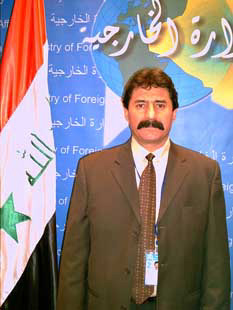 Dr. al-Dilemi is Iraq's current Defense Minister. Dr. Warda was among the first wave of exiles who returned to Iraq after the liberation in 2003. Shortly after he was appointed as an advisor with the Civil Affairs Command (352 US Army). Dr. Warda has been in Iraq for the last ten months studying and training at the Ministry of Foreign Affairs in preparation for his diplomatic position. In other news, an Islamic militant group on Monday captured a badly wounded Japanese man after an ambush near a U.S. base in Iraq, but Japan's government said on Tuesday the incident would not affect its troop deployment in the country. The group, called Army of Ansar al-Sunna, posted a picture on its Web site of a Japanese passport bearing the name Akihiko Saito and an identification card saying he was a security manager. Japan's Foreign Ministry said a British security company that employs Saito, 44, as a consultant had reported him missing after a convoy of vehicles was ambushed in western Iraq. Saito served in the French Foreign Legion for more than 20 years, Foreign Ministry spokesman Hatsuhisa Takashima said. Foreign Minister Nobutaka Machimura said no demands had been received while Defense Minister Yoshinori Ohno said the incident would not affect the work of Japan's 550 non-combat troops in southern Iraq. Prime Minister Junichiro Koizumi is a staunch ally of U.S. President George W. Bush and has previously resisted demands by militants that Tokyo withdraw its troops from Iraq. The deployment -- Japan's biggest overseas military operation since World War Two -- was unpopular. But several hostage incidents involving Japanese, including the beheading of a young backpacker, had little impact on Koizumi's support rates. Six Japanese civilian hostages have been taken since the war began. Five were freed unharmed and one was beheaded. Two Japanese diplomats and two Japanese freelance journalists have been killed. Saito's younger brother said Japan should not withdraw its troops from Iraq in the wake of the incident. (ZNDA: Tehran) Mar Dinkha IV, patriarch of the Assyrian Church of the East, arrived at Tehran's Mehrabad International Airport on Friday morning. Hundreds of Assyrians, holding bouquets of flowers, greeted Mar Dinkha at the airport. His Holiness was invited by the Culture and Islamic Communications Organization (CICO), headed by Ayatollah Mohammadi Eraqi, who welcomed his honorable guest at the airport. During his month-long stay in Iran, His Holiness will be meeting with various Iranian officials, visit the churches in Tehran and Urmia. Mar Dinkha IV was a bishop of the Church of the East in Tehran administering the parishes in Iran at the time of his consecration in 1976. His Holiness fluently speaks Farsi (Persian) language. At a reception ceremony, a number of top officials of the Assyrian and Chaldean churches, members of the Assyrian Association of Tehran (Motva d'Tehran), the Honorable Yonatan Bet-Kolia, representative of the Assyrians and Chaldeans in the Iranian parliament, and religious representatives from other churches were present to greet the Patriarch. 1) It took too much time to be set up. This stems from one weakness, namely the excessive importance given to religion and ethnicity, on being Shiite, Sunni, Kurdish, Christian, Turkmen. These divisions did not exist in the past. To me, there is something wrong in this because we must consider the whole country, not only one’s own group or religion. People should be selected and voted in on the basis of their qualities, not their ethnicity or confession. By using ethnic criteria, people with neither the right abilities nor background have are now in government. They were chosen only to cater to their group. 2) It is a government that is quantitatively representative of the various groups. Shiites are present in great numbers, for instance. But it is a pity that former Prime Minister Allawi did not join. He ran on his own ticket and had relative good results (more than 30 per cent), but no one took him into the government because his party was secular and not religious. This is a mistake. 3) The new cabinet seeks to please everyone and to share power. But this is another mistake because pleasing everyone delayed the setting up of the new government and created an institutional vacuum. This government came into being three months after the elections. 4) Whether there is a Christian minister in the cabinet or not does not interest me. I believe that it is not a good idea to have someone who is the sole representative of the Christian community. The Church must choose those people who work for the good of the whole country rather than for narrow confessional or partisan interests. In any event, there will be new elections in six months and our bishops have decided that there should not be a Christian party. Christians must vote for certain people, but not for their own party. In the last elections, Christian groups were split and lost. If we include Iraqi Christians living abroad we could have elected 14 members of parliament. Instead, group interests (Assyrians, Chaldeans, Syriac, etc.) failed us. I want to make it clear that despite failures and difficulties this government was chosen by the people in a free election. And those elected are representatives of the people even though they might not be completely representative. I hope that ministers work together for the good of the country rather than for the narrow interests of their own group. This is a danger to be avoided. What we must do is focus on personal capacities and the greater good of the country. 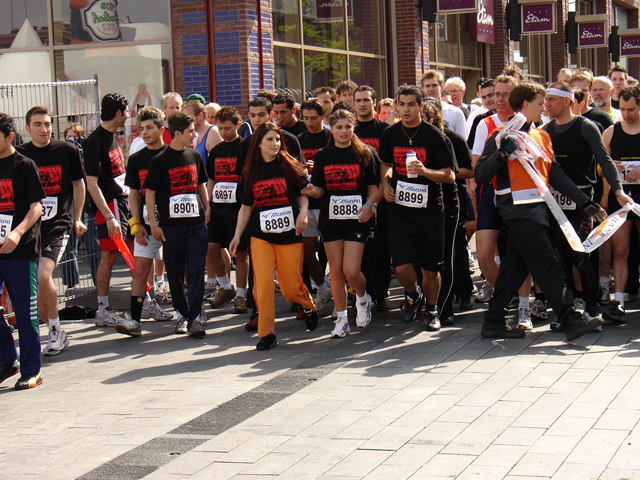 ZNDA: Enschede) On Sunday, 8 May, sixty five members of the Assyrian Youth Federation of Holland (AJF) participated in the Enschede Marathon 2005. 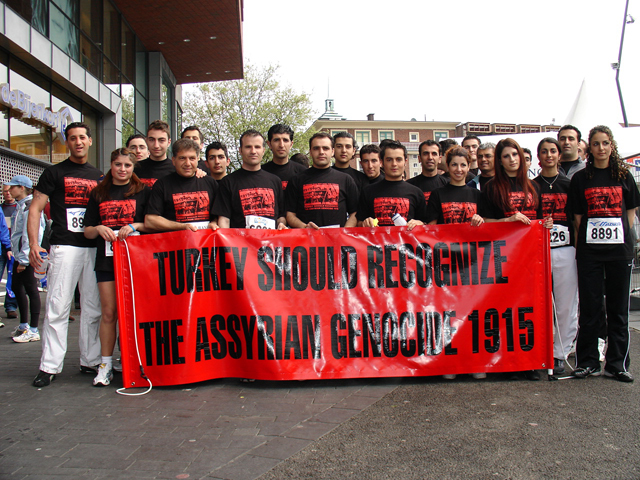 The participants used this event as an opportunity to remind the Europeans about the 90th anniversary of the Assyrian genocide. More participants joined this year after the success of last year's competitions. Some runners were able to run for a short distance, others completed the 21-kilometre run (13 miles), and some completed the entire marathon distance of 42 kilometers (26 miles). 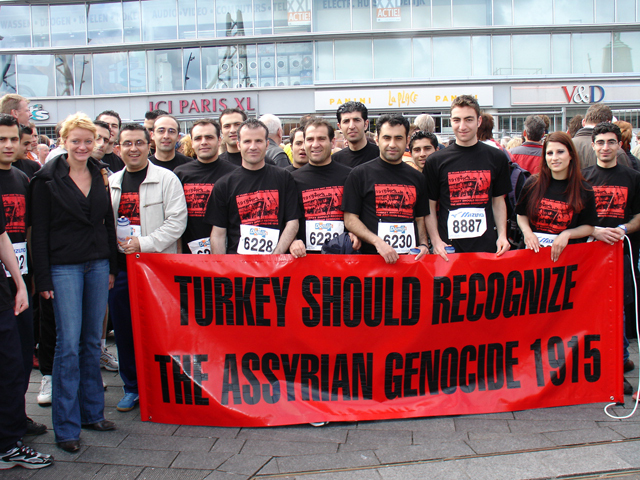 The spectators at the Marathon and the press were surprised to see these young Assyrians promoting the awareness of WWI genocide perpetrated by the Ottoman Turks in which some 750,000 Assyrians lost their lives. Some of the young contestants commented that they will continue their fight for Turkey's recognition of the Assyrian Genocide of 1915. They explain that they consider their efforts as honoring the memory of their people who were martyred. 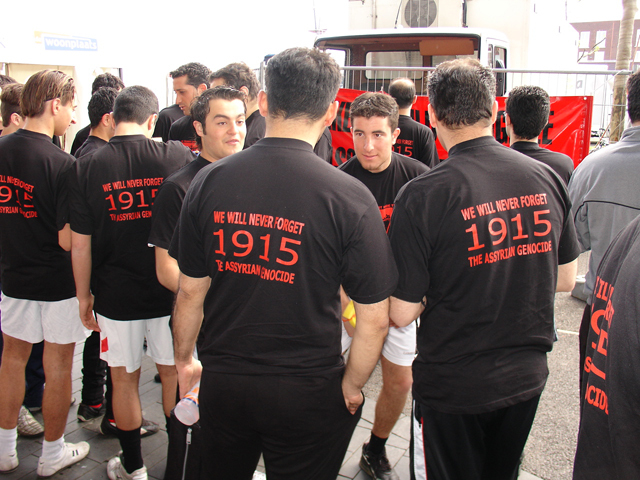 The young athletes from the “Assyrian Youth Federation” wore striking black t-shirts imprinted with slogans in red: "90 Years Cannot Hide the Truth" and "Turkey Should Recognize the Assyrian Genocide of 1915". The slogans used during this and previous demonstrations throughout Europe have now become familiar to the European audiences. "The participation of the Assyrian youth in such demonstrations serves to inform the world that the Seyfo Genocide still lives in our collective memory," commented a spectator. 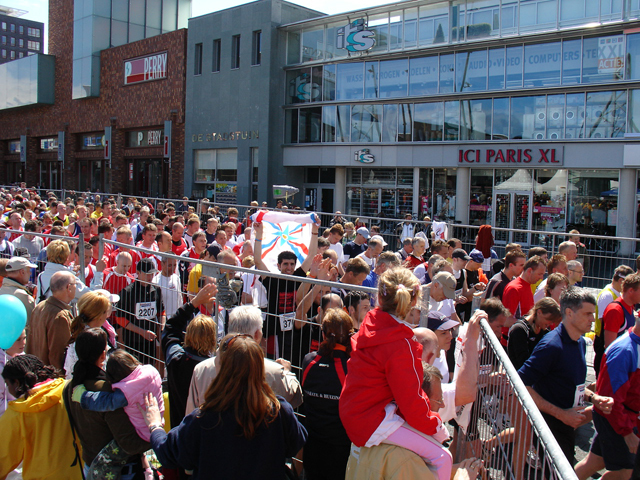 The organizers noted that more young people are expected in next year's demonstrations in the Netherlands. 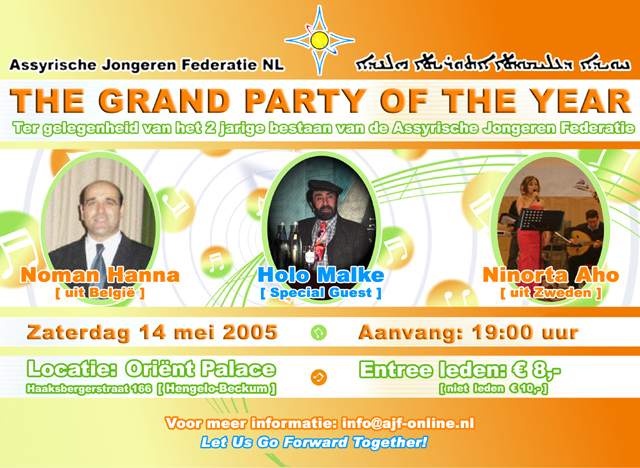 Similar activities have already been scheduled by the Assyrian Youth Federation (AJF) in the near future. (ZNDA: Chicago) An Iraqi grandmother who fled her homeland in fear five years ago was granted asylum Monday by a Chicago immigration judge who ruled that returning to Iraq would endanger her life. Ghanima Matti, 70, broke into a wide smile as Judge Carlos Cuevas said he would not send her back. Matti, who lives with relatives in Skokie, shook the judge's hand, kissed the government attorney who argued the case against her, and then hugged her lawyer. "Now I can live in peace," Matti said later through an interpreter. "I'm too much happy," she said outside the courtroom. "I was scared to go back." Matti, an Assyrian Christian, fled Iraq in January 2000 after Saddam Hussein's security forces targeted her family. She said her trouble began when one of her three sons, Basil, joined the Assyrian Democratic Movement in 1999. Basil fled the country for Sweden in late 1999 after hearing Hussein's forces wanted to arrest him. A short time later, Matti said, Hussein's police began harassing her and her husband, asking where their son had gone. A rumor began to circulate that Basil, a doctor, had caused the death of a prominent Muslim. Matti said that on Jan. 6, 2000, a group of men came to her home and asked where Basil was. Her husband, who had a history of heart problems, was pushed to the ground and died in the street of a heart attack. After her husband's death, Matti continued receiving threats, including one phone call in which she was told "the same thing that happened to your husband, we're going to do to you," she testified. Months later she fled for Jordan, then came to the United States in December 2000 on a visitor's visa. She applied for asylum in June 2001, but a Chicago immigration official referred her case to court, citing inconsistencies in her oral and written statements. Because so much has changed in Iraq, some experts had said a judge might rule that it was safe for her to return. Matti's attorney, Taher Kameli, had argued that despite the ouster of Hussein and the recent elections, Iraq remains unsafe, particularly for Assyrian Christians. Matti testified that her brother and sister, who remain in Iraq, live in fear. "I just talked to my sister the other day, and she said that's all there is--fear and cars packed with explosives," Matti said. While questioning Matti during the hearing, the government's attorney, Audrey Lawless, said that two Assyrian Christians had been elected to Iraq's new National Assembly and that Matti's brother and sister have not been targeted. Before Lawless started talking, Matti interrupted the proceedings and pleaded with the judge. "I'd just like to ask you, your honor, I'm 70 years old, you have to keep me here," she said through a court interpreter. Cuevas agreed. The judge said Assyrian Christians, a minority in Iraq, remain the target of violence, and Matti would be unsafe if sent back. "I believe that the country conditions have not changed for you," Cuevas said in his ruling. "... If they have changed, they have gotten worse for you." The judge agreed that Iraq has changed since Hussein's government was toppled but said that despite the coalition forces' best efforts, it was not clear they could protect Matti. "I will not send you back to Iraq," Cuevas said. Matti, who spends her days baby-sitting relatives' children, said she planned to celebrate Monday night by cooking a traditional Iraqi meal at home. Immediately after the hearing, she said she was going to call her sons and two daughters and tell them the news. Government attorneys have 30 days to appeal the ruling, but Lawless did not tell the judge what the government's plans were. "Had she gone to Iraq, it definitely would have been the death penalty," Kameli said after the ruling. "We do appreciate what the U.S. soldiers are doing there right now, but they cannot assure the safety of individuals like Ms. Matti and the judge felt that and observed it." There is a tendency among the Assyrians who don’t even bother to devote any time to serve their community to harshly criticize those who do, often based on false premises. It is an easy way to pretend that with their infinite wisdom they would have done things differently if they were in charge. It is one way to glorify oneself and wash away the guilt of not doing one’s share. They consider others intellectually inferior and insist on having it their way or the highway. In democratic associations, where the decisions are made based on the will of the majority, such people are usually an obstacle to progress. While polite and valid criticism based on facts is necessary for promoting success, slandering and character assassination and spreading false rumors can only lead to demoralization of those wrongly accused. We the executive board and the board of directors of the Assyrian American association of Southern California hereby feel it to be our duty to respond to certain articles and unfounded accusations that have been made against us and our leader. Be it known that our members democratically elect us, and that we, like other board and executive members of other Assyrian associations, are volunteers. We are here to serve our people and we do so because of the love and passion that we have for our culture and heritage. This is especially true of our President, Mrs. Shamiram Tabar, who has been a dedicated, member, board member, and chairperson of this association for the past twenty years and she is currently not only the president of this association, but also the vice president of the AUOC, and we take pride in having her as our leader. We have a website known as the www.aaasc.com, which is, in fact, quoted by some individuals to be “a spectacular site” see our guest book entry of June 1, 2004. On our website we host and announce many of our events. Our yearly events include many seminars, youth activities, sports teams, plays, art shows, Assyrian language classes, Assyrian dance classes, T.V. program, picnics, a choir under the directorship of renowned Assyrian Composer, Nabu Issabey and a host of other events. These events are all fully advertised and all individuals are welcome to attend, without regard to membership. We are quite disheartened by the fact that even though as president, executive officers and board of directors we have mostly devoted our lives to this association and our people that we receive misdirected criticism. Constructive criticism is an asset and always welcome. However, constructive criticism should present cogent and thought alternatives to the current state of affairs, rather than mere assertions and invective. We as an association take pride that our accounting is performed not only by a treasurer, and controller, but that an outside firm audits all accounting papers and procedures annually. 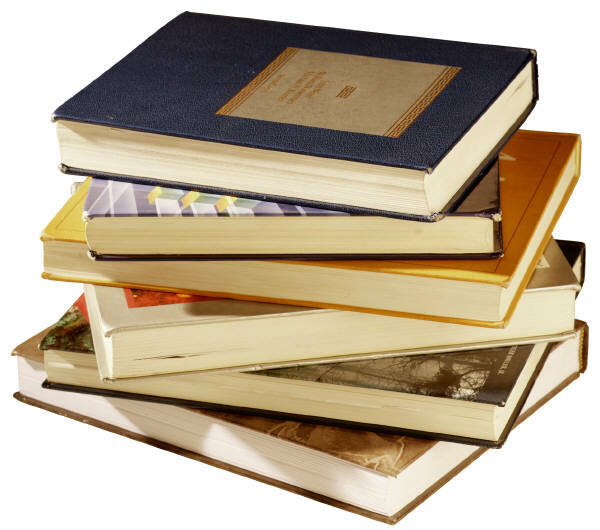 Further, we have always kept all of our books open for inspection by, once again, all individuals. 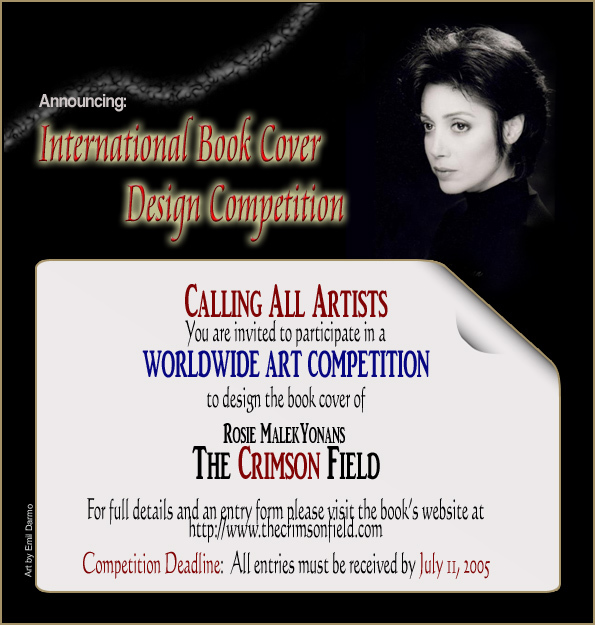 So all one needs to do, is ask to see the books, and they are immediately made available. A financial statement in the form of an annual report is supposed to gauge the financial health of the Association, their income, expenses, assets and how we did in prior the year not focusing on a single activity per someone’s specific format. So even though we are grateful for the accounting lessons provided, we will make sure to ask the meaning of "implicit and explicit cost" from these professional accountants. To add to our position, let it be known that our association is not in the “red”, nor has it been in the “red” during our administration. We take pride in offering a variety of programs to all members of our community and to date we have not heard an individual tell us that they would like a new type of program that we have not honored. We are here to serve our people. However, in service we need to have a line of communication wherein it is not just us informing our members of our activities in a civil manner, but our Assyrian brothers and sisters also communicating with us in a civil manner. According to the Oxford Dictionary, “respect” is defined as “deference, esteem or honor, avoid degrading or insulting or injuring; refrain from offending…” Imagine what a better Assyrian society we would be living in, if instead of having individuals disrespect their civic leaders, we actually supported them and as a result each other. We are pleased to see that we have young and brilliant Assyrian minds that wish to express their thoughts, but this can be done in a rational manner so that its service can be respected, rather than in an invective that might appear to same as little more than a youthful “wish-list”. Disrespect in its truest form is shown when such individuals who do not wish to take responsibility for any action take it upon themselves to simply belittle others and do not stand tall and take responsibility and make use of their best skills. The challenge is not in simply being critical. The challenge is in believing what you stand for and following through with action. It is very simple to only criticize; that is a job any individual can do, and do well. We hereby challenge you to make your suggestions in a cogent and non-confrontational fashion and participate in the Assyrian democratic forum. I refer to the essay in ZINDA dated April 9, 2005, titled “Latest News from Assyrians in Jordan” by Toma Rouel Youkhana. Toma says hundreds of Assyrian students have completed language courses taught by Assyrian volunteers in Jordan. He also mentions that through the financial support of Bishop Mar Bawai Soro and his churches in California and many other donors more than 350 students have also completed the basic computer skills and that with donations received from the Assyrians of the United Arab Emirates seven personal computers were arranged for instruction That is well and good. But why does he mention some contributors and leave out others? Assyrian foundation of America sent over $60,000.00 since 1995 and until now to help the needy and sick people as well as for education activities in Jordan. The Assyrian Church of the East donated a total of $35,000.00 through Bishop Mar Bawai Soro of California, Bishop Meelis Zaia of Australia, Rev. Jamiel Warda of Turlock, California, Rev. Gewarkis Toma of Melbourne, Australia, Rev. Antwan Lachin, Chicago, Rev. Amanouel Beato, Germany. Mr. Mikhael K. Pius, Editor of HUSCA magazine in Modesto, California, contributed $4,160.00 through the Assyrian Foundation of America to the Assyrian people in Jordan. Mr. Pius raised this amount in profit and donations through the sale of his two self-published books and a special newsletter he published and distributed in memory of his 33-year-old nephew, Ben Pius. Mr. Younadam Y. Kanna, Secretary General of Assyrian Democratic Movement, contributed $500 when he visited Amman on his way to London. Assyrian people in United Arab Emirates (Dubai) supported by contributing computers to people in Jordan. Thanks to all the above and thanks to God that we still have Assyrians who care to help our needy Assyrian communities in different parts of the world, especially in Jordan. Since his elevation to the rank of patriarch back in 1976, Mar Dinkha has not shown any intention to help his Assyrian faithful progress domestically or globally. His leadership has guided the Assyrians to “no where”. Worst than that it has caused more than half of the Church's hierarchy to despair and ultimately to engage in various types of shameful scandals. His Holiness Mar Dinkha does nothing to help the misfortunate Assyrians of Iraq. For the past twenty years, he never moved a finger to financially or spiritually help the Assyrians who escaped from Bet Nahrain to the neighboring countries of Jordan and Syria for safe haven. Many families and single young people who live under the mercy of the Jordanian Government are poor and get no help except from their relatives who live abroad. Our people in these countries need a priest to comfort them and to offer them the Holy Qurbana since many of their newly born are being baptized in churches elsewhere. 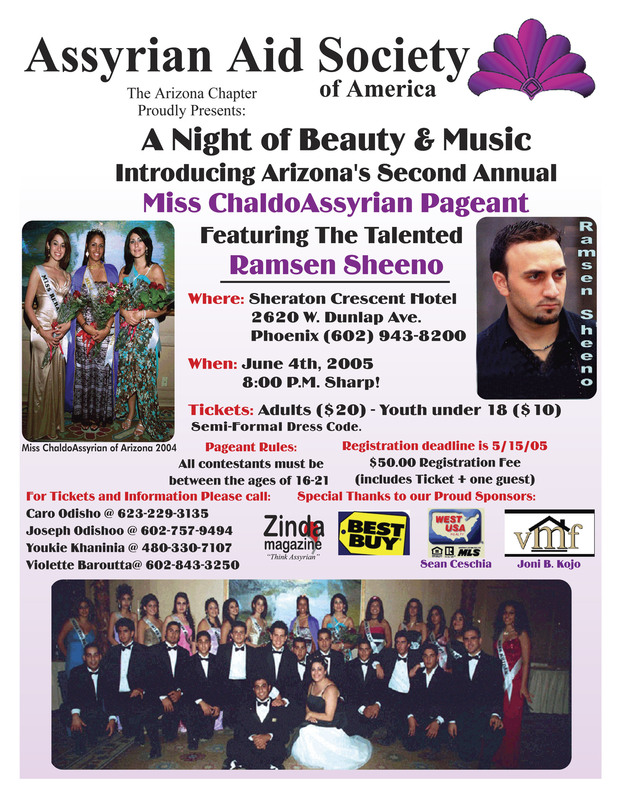 Assyrian American Association of Southern California. Assyrian Association of Southern California has spent considerable amount of money during the last few years to bring our young athletes together to have fun while playing basketball and to get an opportunity to form lasting friendships. Portion of the proceeds from this event will pay for the future expenses of the team. Unlike the late Mar Eshai Shimun, His Holiness Mar Dinkha was not expelled from Iraq. The past Iraqi government felt that Mar Dinkha, as an Assyrian leader, posses absolutely no threat to their "national security." But, Mar Dinkha chose to leave his Assyrian people and his patriarchal see in Iraq to live a lifestyle of luxury and comfort. Is this how the other patriarchs in Iraq are living? Let's ask Mar Addai and Mar Emmanuel what kind of price they pay for their daily struggle among their own people. Let us also ask the Chaldean Bishops why did they hold their Knoshya [Synod] in Baghdad last month, despite all security threats and danger. Out of fairness to our beloved Patriarch, I must add the following. Mar Dinkha has been consistent in one important thing. He broke many laws of Sonhadus but he always places the blame of his bad judgment and deed on someone else. Many hopeful Assyrians, myself included, were waiting for Mar Dinkha to act like a true leader and make his historical move when Iraq was being liberated two years ago. There was a golden opportunity for our Assyrian Nation to be a part of the Democratic process and assert its rights and new role in the New Iraq, forever. But, instead, we sadly learned sooner than later, His Holiness does not want to be bothered with what was going on in IRAQ. His famous statement still echoes in the ears of many “Let the politicians sort it out. I shall not intervene in politics." Your Holiness, what is wrong with rallying with your own people and solving their problems? Isn't this what Mar Benyamin used to do for our people, and he dearly paid for it? Isn't this what ALL the patriarchs in Middle East are doing even today? They are slowly suffering with their people, but this is what a Father does for his family. If you would not consolidate the vote and the power of all Iraqi Christians as one who then will? Why are you not tending Jesus’ sheep, Your Holiness? In the service of our Assyrian Nation in Iraq, many Assyrians think that His Holiness should have by now connected with the new Iraqi Government and presented himself as the spiritual leader of Assyrians, and the head of the Church of the East. This is said because Christians in general and Assyrians in particular need to be included in the future dialogue on the Iraqi constitutional issues and on any amendments pertaining to OUR homeland. While he would have been at it in Iraq, when he would visit the Assyrians in the USA, he would then establish communication with the US officials as a legitimate representative of the Assyrian people in Iraq and elsewhere. Again, to make sure that the US will safeguard the rights of our people in Iraq. But, who is counting? Don't I wish Mar Benyamin was alive now? But instead of taking such historic steps, His Holiness Mar Dinkha is busy walking the shopping malls of Chicago and exercising in the parks of Illinois, with his baseball cap on, of course. When it gets too cold or too humid in Chicago, he flies to California for a climate change. Even worst, last week our patriarch set his sails to England and to Iran. Why these two countries now and not visit Iraq to heal the spiritual wounds of our people there. Is he afraid? Is there some special reasons for His Holiness' visit Iran or is it just a pretext for not being in Iraq? Your Holiness, do what is right for this Church and for this nation! Sending letter to the GS of the UN and the heads of the various countries means absolutely nothing, unless your letters are backed with a sincere and timely sacrifice by yourself. The weight of your letters is equal to the weight of the letter that was sent to President Jalal Talabani by David Malik Yaqou, the murderer of our Late Patriarch Mar Shimun. They both mean nothing! Mar Dinkha has failed us, we the Assyrian people, and has failed all the people of Iraq, the homeland of Assyria. He has even disappointed Christ by his unfruitful leadership and by abandoning the most needy flocks. Let us all ask the Lord for His blessing and mercy upon our Church, nation and people everywhere. Mrs. Jacklin Zomaya does not literally expect Assyrians around the world to accept the notion that she and her Kurdish cohorts are the ones who are truly the representatives of Assyrians and Chaldeans in Iraq. She should spare us her sickening rants. It was absolutely disgusting to see her display her idiotic comments in the Iraq Parliament which were ashamedly broadcast on many of the Arab satellite networks (including al-arabia). She not only made a fool of herself but also degraded the Assyrian cause which just recently was experiencing a long needed ray of light. As Fred Aprim (last edition of Zinda) highlighted; it is inconceivable that she was elected with the support of the Kurds (who let's not forget murdered countless Assyrians and burnt some 200 villages to the ground) with the Kurds thinking that she is in the National Assembly to support the Assyrian cause. She (and the other Kurd elected Assyrians) are simply trophy’s which the Kurds are using to show that they have some sort of humanity and that they are in support of basic human rights. On the other hand, Mr. Yonadam Kanna is and remains the only TRUE representative of Assyrians in Iraq as he himself was actually elected by Assyrians whereas the meddling Mrs. Zomaya was elected by the Kurdish peoples. So let her stop this masquerade of actually caring about Assyrians and fess up to her (and her Kurdish superiors) real plans - that is the slow extermination of Assyrians and the taking of Assyrian claimed areas in addition to the lucrative Kirkuk. In a telephone conversation with the Baghdad headquarters of the Assyrian Democratic Movement (Zowaa), I was the first to be clued-in of a shighda (surprise), which was the set-off of Ashur TV airing for the first time on Niles Sat, 11919 frequency. The proud Mr. Ishaq Ishaq even permitted me to listen in to the program telephonically as it was being aired. Besides, he told me that I was the first in the world, outside of Iraq, to be informed of the news. Join me in congratulating Ashur TV and the Assyrian Democratic Movement on a worthy progress made possible by over six months of labor and commitment. Cheebo! I would like to respond to a reader who posted last week about a photo taken in a speedy bus in Warsaw, Poland of a restaurant called Hamurabi. 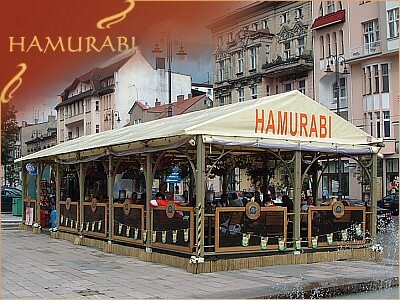 Yes indeed there are five restaurants called Hamurabi in Warsaw area, also one in Gdansk, Poland. I contacted my friend who manages one of them and he gave me a web site so anyone can contact them. Sorry that it is in Polish language. They cook yum yum Middle Eastern food. Please log on here and see for yourself. I wanted to congratulate you on this bold move. 10 years ago you had a noble vision and because of that Zinda was born. Today moving Zinda’s office to Washington DC to become a focal point for Assyrian activism and building a bridge between Assyrian activists and US politicians is another noble idea and only God knows what this will bring us. May God bless you for serving our people at this crucial time in our history. Sincere congratulations for your courageous move to Washington D.C. It is about time that our Assyrian organizations free themselves from the mental cocoons that they have been living in and thus limiting their social and political capabilities. 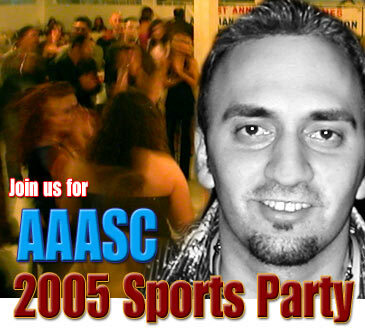 The Assyrian American Association of Southern California (AAASC) is encouraging participation of all the students of higher education either current or graduates to attend this kick off meeting to be held on June 12, 2005 at the AAASC Facility located at 5901 Cahuenga Blvd, North Hollywood, CA 91501. May God bless you and may God bless our Assyrian nation. A civil war in Baghdad is already under way and although it is not publicly acknowledged but is gathering momentum. There are three parties involved one is the main provoker and the second is moving slowly to combat and the third is still waiting for what to do. The formation of the transitional government in late April approves the divisiveness of the nation and affirms the make up of this civil war; it also promotes this civil war. The new government is labeled as the ‘national unity government’ but this is a farce and it is a rather doomed government prior to a declared civil war. To examine the nature of the government you have to start from the top of the echelon with a President and two Vice Presidents each belonging to one party. The Vices are not Vices but Presidents and there is no such system of three Presidents worldwide. The executive body is made up from 37 members including a Prime Minister and four Deputies. Again the Deputies are not Deputies but four Prime Ministers each belonging to one party or sub party. All this is to allow the government to exist and function in name but without a grasp or a foothold to run the nation and serve its people. It is a government in office but not in power. What sort of a nation is it the state of Baghdad to have three Presidents and five Prime Ministers with 32 novice ministers? Does an exhausted nation whose people are half fed and half naked need such a colossal administration? A nation with three Presidents and five Prime Ministers does not require a Brata Mshihetha to turn the tables because we are already wiped out and our claim for region nationalism is nearly dead. Is it not all this make up a symptom of ungoverned nation and we the Assyrian Mshihaye where do we stand once the break up has become a reality? We were promised a better representation in the coming administrations but that proves otherwise; we are getting less and less voice. A nation run by three Presidents and five Prime Ministers and 32 novice ministers should not be recognised as a nation. All this is a sign of division and disintegration and the streets of the nation are as a proof. The US President runs a federation of 50 states with 296m people (internet) and have one deputy, needed only as a successor in some events and with only a dozen of portfolios. At home the late Abd Al-Karim Qassim, a soldier, run the First Republic alone with a dozen of soldiers with him and the nation witnessed perfect peace and security and progress. The triumph of 9 April 2003 is gone and the bright future foreseen after that is also gone and the forces of evil from inside and outside the country have foiled that triumph. They are both in tandem fueling the civil war on the streets of Baghdad. Miskenta our Brata with a mission impossible or not needed; her only task is to update her CV and collect her salary each month. David Yousif is extraordinarily savvy about Saddam complex personality; and his writer’s radar picks up more than most. In his first book, Killer since Birth, he performed with pitch-perfect style. David takes on a hefty subject, but does it with a light touch. He gives a fascinating account of a ruler turning from a poor uneducated upbringing to be a committed tyrant with ambitions to lead the Arab nation. This book is never dry or dull; the writer keeps the action and emotion going strong. Each chapter leaves you wanting to read the next. I frequently found myself wondering "What's going to happen?" even though I already knew. David achieves this effect both through his attention to action and his ability to present the story of Saddam on very personal levels. He includes anecdotes telling the stories of many individuals, some of which read like Hollywood movie plots. The result is a page-turner that leaves you with humble gratitude for the men and women of the day. He helps us see again that Saddam is not only a person worth reading about, but worth remembering his brunt on the Assyrian people. There is no dearth of literature on Assyrian Holocaust and Saddam. But events so cataclysmic, even many years later, continue to inspire research into stories not yet fully told. Such is the case with Killer since Birth: Assyrians trapped and killed by Saddam; Kurds wreak havoc to the Assyrian villages; Kurds worked with Saddam in cleansing operations; Assyrian singers were stifled and imprisoned; political parties were not tolerated; even social clubs were ordered to close. In this writer opinion; as a first step toward understanding of the Assyrian conflicts, it is necessary to examine Islam as a major determinant in the genesis and escalation of these conflicts. The precepts and infallible dogmas of Islam, as interpreted and applied within the framework of a theocratic Saddam state organization, encompassing a congeries of Assyrian Christians, proved to be enduring sources of division in the relationship between the dominant Muslims and Assyrians. In many ways conflicts were and continue to be a replica and an extension of conflicts plaguing the relationships of the Assyrians in Iraq with Saddam and Kurds who, as conquerors, play the role of overlords towards Assyrians over a long period of time. In this sense, it may be observed that Islam not only functioned as a source of unending nationality conflicts both in the Iraq and Kurds dominated areas, but it also functioned as a nexus of the correlative Assyrian questions, through the explosion of which the issues of creed and religious affiliation for decades were catapulted into the forefront of conflicts. Although Islam is a religious creed, it is also a way of life for its followers, transcending the boundaries of faith to permeate the social and political fabric of a nation. Islam's bent for divisiveness, exclusivity, and superiority, which overwhelms its nominal tolerance of Assyrian Christian religion, is therefore vital to an understanding of a Muslim-dominated, multi-ethnic system such as Saddam. 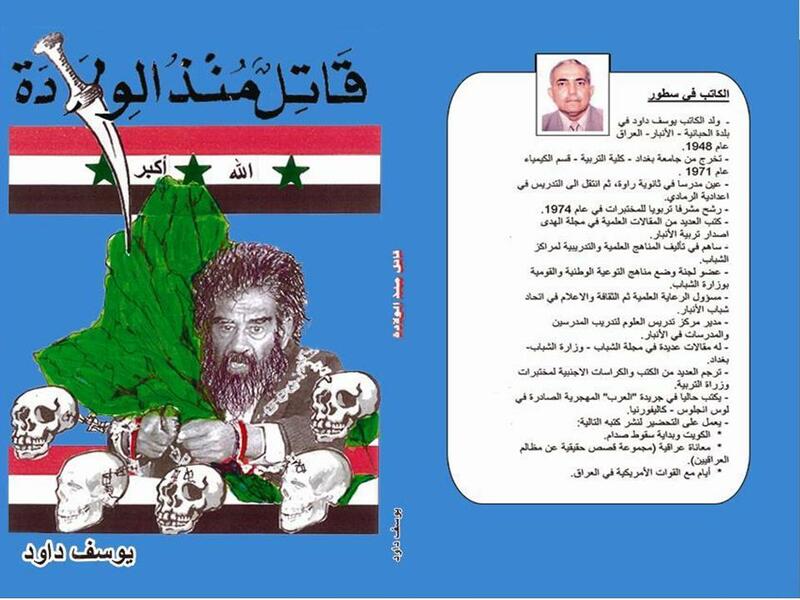 This is a book that every Assyrian must read. Zinda: Mr. Dan Daniel is a deacon (shamasha) in the Church of the East and has previously contributed to the pages of this publication. 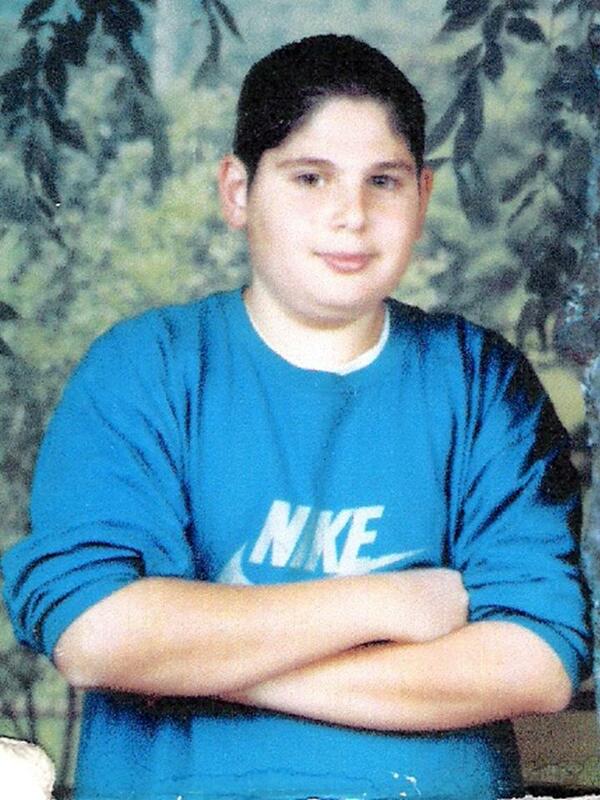 Viktor Sarkis's essay has been nominated as a finalist in the "Do the Write Thing" essay contest. (ZNDA: Chicago) "Do the Write Thing" is an annual essay writing contest in which thousands of 7th and 8th graders compete by submitting written proposals aimed at reducing youth violence. The program is an initiative of the National Campaign to Stop Violence, a coalition of business, community, and governmental leaders and volunteers. The program’s primary objective is to motivate seventh and eighth graders to make a personal commitment not to engage in violent acts and do something to reduce youth violence. This year, the essay written by an Assyrian student from Chicago, Mr. Viktor F. Sarkis, 13, has been nominated to the final competition representing the city of Chicago. Ten finalists will receive scholarships and the top two will be attending a dinner in Washington D.C. in July where a national winner will be announced. The two national finalists’ writings will be published in the Library of Congress in Washington, D.C.
Violence affects me in one major way, it puts fear into me because when there is violence it is not safe to go outside to bad places because you never know who you are going to run into and you don’t know whether he is a good person or a gang banger. Violence in many places. I normally don’t see violence within my family but I do see it on TV, in games, and other things like that. There is also violence at school. The violence that I see at school is people swearing at other people when angry and also people hitting each other in the classes and hall ways. Also once a blue moon there is fights that break out that are violent. But the place that I see the most violence is in my neighborhood and on the streets. People are sometimes yelling and swearing at each other and even though I haven’t seen that many there are people getting into gang fights and other things like that. Also the violence that is seen in my neighborhood is with my own friends. Sometimes my friends swear at each other when mad and once my brothers two friends actually fist fought and one of them got a big bruise and a bloody nose. To reduce violence in my community, a neighborhood watch could be started and have people watch out for people who are causing trouble and also for those people who get into many fights and are violent. Violence can occur between teens in many ways. When one person annoys another person that could lead to violence. Violence can also happen when two people argue about a girl and that may sometimes lead to fights. Violence can also occur when waiting in line to get a movie ticket. You may accidentally trip over a foot and knock a person down and that person might think it was intentional and may start a fight with you. Many people don’t see much violence around their homes because they either live in a good neighborhood or they live near a police station. But still those people experience violence in schools a lot. They might see people swearing and fighting and then they might become violent, and then their good neighborhood might not be good anymore. Some of the causes of youth violence is TV. There are many shows on TV that promote violence and little kids are getting exposed to that violence and then grow up violent. Also kids might see violence in their home on a regular basis and might get the idea that violence is okay. Another way that kids are exposed to violence is through games. There are some games that kids really like and get into and they might think after a while of playing that game that violence is okay. Kids should not play mature games like Halo 2 and Mortal Kombat. In Halo 2 it is basically a killing and shooting game. Also there is an online thing and usually after most multiplayer games the two teams argue and swear at each other. Mortal Kombat is a regular fighting game with a lot of blood and the whole concept of the game is violent. There are people getting bashed, getting their heads cut off, and also people just basically getting decapitated. In other games the players have lives and that would give the idea to a kid that he has lives and other people have lives and that he could go around killing people and they would just come back with another life. Mature games are not all that bad but kids who think that everything is real should not get those kinds of games. Violence is seen everywhere but there are many ways to stop the violence like by parents not exposing their kids to violence at a young age, people not getting mad and getting into fights for no good reason, and by not putting yourself in places where the only thing to do is to be violent.